Painted Hills. 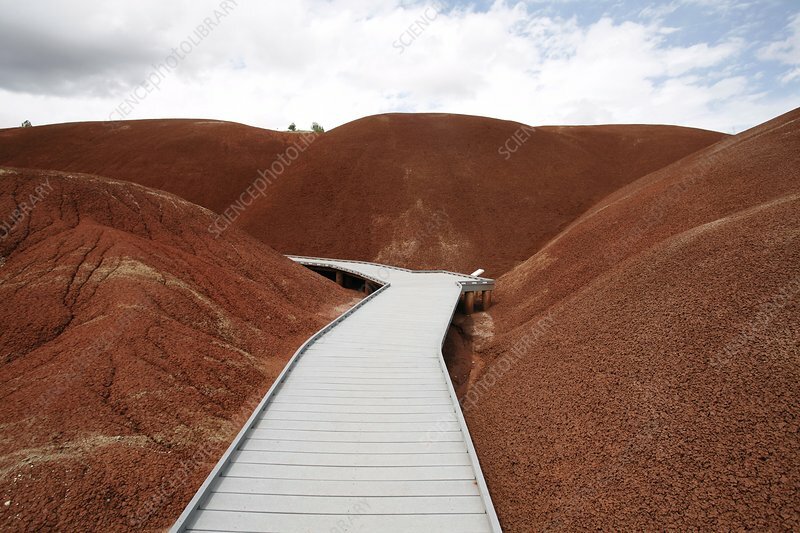 Interpretive boardwalk trail at Painted Cove in the Painted Hills Unit of the John Day Fossil Beds National Monument, Wheeler County, Oregon, USA. This site is located within the basin of the John Day River, east of the Cascade mountain range. It was once an ancient floodplain. Clay and ash sediments form red, yellow and black layers dating from between 40 and 20 million years ago, during the late Paleogene and early Neogene. The colour of the sediment indicates its origin. The sediments and ash aided the formation of the numerous fossils that are found here. Photographed in 2010.